Are Universities More Engaged With Their Cities Now? Throughout the 20th century, Eastman Kodak–whose bankruptcy has been in the news recently–was the largest employer in the city of Rochester. But 70 years after George Eastman’s death, another institution he helped build took over that mantle. In 2006, the University of Rochester became the largest employer in the city. Jeff Selingo, the editor and vice president of The Chronicle of Higher Education, opened a panel featuring the heads of four major urban research universities by citing Rochester as an example of how institutions of higher education have become more important than ever to their surrounding communities. “The knowledge infrastructure provided by universities is more important than other investments,” he declared to a capacity crowd at the California Endowment. 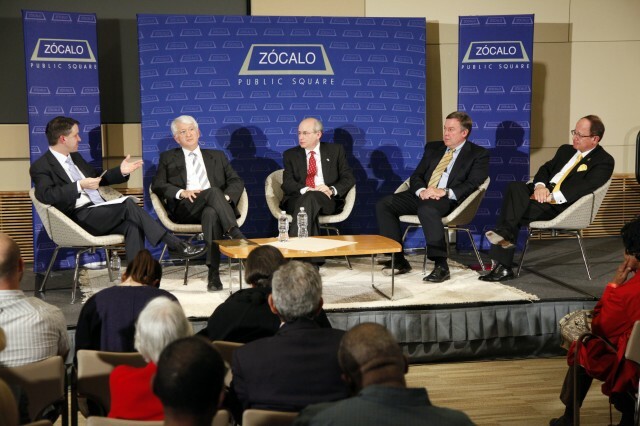 But although the panel was entitled “Can universities save cities?”, and the panelists agreed with Selingo that the relationship between town and gown is vital and complex, they felt that universities alone can’t save cities–nor do cities need saving. President David Leebron of Houston’s Rice University agreed, noting that the worldwide trend is for an ever greater proportion of people to live and work in cities. Cities will survive. “The real question is, can universities make their cities more competitive and make them more competitive on a global scale?” he asked. 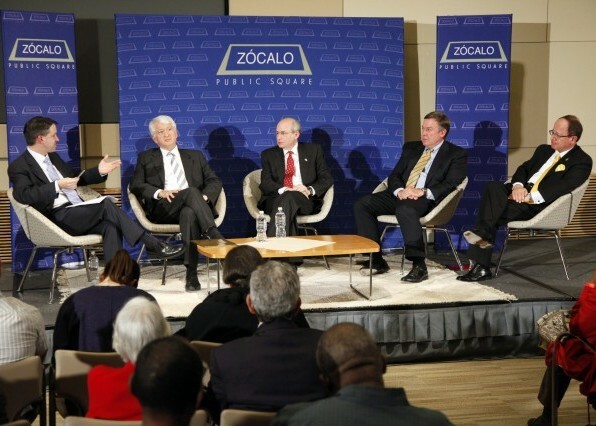 U.S. cities can best compete with places like Shanghai and Singapore if they operate on a regional, rather than a city scale, said Arizona State University President Michael Crow, pointing to the three “megapolitan” regions where all four panelists’ institutions are based: the Houston metro area, Phoenix and Tucson, and Southern California. USC President C.L. Max Nikias pointed to the ways USC, UCLA, and Cal Tech have contributed to the growth of the region in the past century. “Los Angeles wouldn’t be the same without these three universities,” he said. By educating people across disciplines–cinematographers and scientists, artists and engineers–they’ve provided “the manpower and the womanpower that the city needed to grow.” Job creation is another key way in which universities can impact their communities through both development projects and the startups that are a product of research innovation. Leebron pointed out that despite a focus on startups, universities can also contribute to existing industries in their cities. “I’ve asked myself, would the car industry have been different if the University of Michigan had been located in Detroit instead of Ann Arbor?” he said. But the contribution isn’t just economic. “Do students in Houston feel that Rice is attainable to them?” Selingo asked Leebron. Yes, Leebron replied, pointing to the university’s growing diversity. It takes a concerted effort from faculty and the admissions office for Houston natives to enroll, and although a small university like Rice makes other, bigger contributions to city life, “it is really important,” he said. At the other end of scale in terms of size, ASU–the largest research university in the country–is trying to increase accessibility while building a massive university research platform and using the admission standards of the University of California system in 1950, said Crow. Selingo asked how the universities are dealing with real estate and tax issues in their cities as they expand or move. ASU, said Crow, has “gone into intensive partnership mode,” with Maricopa County’s many municipalities funding major finance projects, while the city of Phoenix has invested over $200 million to move three of ASU’s schools to Phoenix. Nikias avowed, however, that USC is “not a real estate company” and is “in the business of educating people and doing research.” They’re going to be in Los Angeles “for another thousand years” and have no plans to expand. “I refuse to dilute the value and quality of the USC degree by setting up a campus somewhere else,” he said. Leebron doesn’t think multiple campus expansion is in the future of most public and private universities. Instead, he believes that universities will collaborate more intensely from within. The first job for every college and every university, said Crow, is to remain true to the original design of the Greek academies they are based on, and to be a home for teachers and scholars. The responsibility is to the students first–and then to the community. Crow is wary of faculty members being “robotically engaged” in their cities. But when an institution’s aim is broadened, engagement happens naturally. The key, Nikias agreed, is that engagement has to become part of the DNA of the ethos and culture of the university. Block, too, felt that overt encouragement to get professors out of the ivory tower wasn’t needed. Los Angeles itself is a research lab, he said, with its complex social, economic, and transportation problems. “This is ground zero for a lot of these problems,” and it keeps professors from becoming insular. Read expert opinions on what responsibility universities have to their cities here. *Photos by Aaron Salcido & Sarah Rivera.